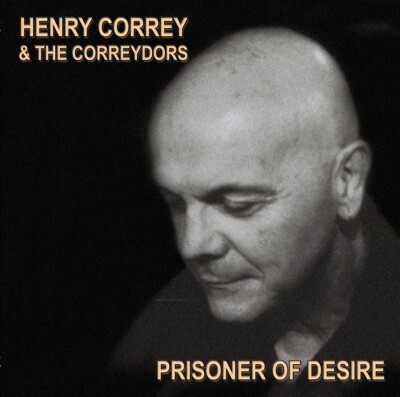 Here we are with a new offering from Henry & the Correydors and it ‘kicks arse’! Since HEAT of the MOMENT (2003) we’ve had a minor (or major – depending on how you look at it) line-up change with guitarist Allan Vander Linden leaving and being replaced by the redoubtable Mick Pandelis. A Correy sideman of some years standing! The previous album included Psycho Zydeco’s Stefan Sernek among its featured players. Stefan isn’t here this time however, we do have Steve O’Connell tenor saxophonist from well known and liked Sydney band, the BELLHOPS contributing his talents and (for my money at least) the best ‘blues’ harmonica player in the country, my dear friend Ron King from the truly legendary and much loved Foreday Riders Blues Band who have been part of the Sydney scene for closing on forty years. Sorry Ron! Once again the album was recorded at A# Studios in Riverwood (Sydney) and even has ‘studio boss’, Jeff Cripps contributing ‘Slide guitar’ on the opening track, Standing Here Alone! Standing Here Alone is first cab off the rank and kicks in with a burning ‘slide’ intro reminiscent of the very best Elmore James (from Jeff Cripps) and doesn’t let up. Henry is in great voice and singing what he does best – a rockin’ blues! Smokin’ George Babich does just that and lights up with the first solo. Henry again and then ‘new’ guitarist Mick Pandelis takes flight with a solo every bit the match for George and Henry comes back to take us home! Hooked On You is next up and introduces us to the tenor saxophone playing of Steve O’Connell! While it is not one of my more favoured tracks, the band are in fine form with great ensemble playing and soloing and, once again, Henry is in great voice! Did I Ask Too Much brings the band back into the territory that I think it excels in, great kick arse rocking blues and introduces Ron King playing harp as only he can - brilliantly executed fills and understated soloing that can only add to the overall! Without Love is next up and is a real departure from the norm for these blokes! Definitely tasty and highly commercial and featuring some wonderful interplay between the two ‘guitar monsters’ trading licks with each other! Tiger Jump swings like crazy, is all taste and is introduced by a sweetheart of a solo from its composer (George Babich) before handing over to Mick Pandelis keeps the momentum up where it should be before handing it back to George bring this one home. Instrumental and one of my favourites – I tend to listen to this time and again! We Don’t Talk opens with an interesting head and leads into a lyric line about a man not understanding what’s happening when couples don’t talk to each other and drift apart. Once again some great soloing and ensemble playing from the band. Do You Remember has an interesting lyric line that is similar in its intent to that of Lowell Fulson’s Reconsider Baby. Things change with time! Great singing from Henry and powerful soloing from George and Mick! Another of my favourites, Mystery is next up! Opens with a great guitar lick and has a highly syncopated backbeat that touches on the outer reaches of reggae. Great tenor solo (wish it were longer) from Steve O’Connell. Henry sounding great! Another very ‘commercial’ sounding effort with a great hook! Better Off Alone shows Henry in full flight vocally and once again features Ron King on harmonica playing a killer solo second up, following an enormous guitar solo from George in the first instance. The track just keeps on running headlong like a freight train with no brakes in a solo from Mick. A real house-rocker! Poke In The Eye written by Mick Pandelis follows. Killer instrumental – short and sharp – featuring the talents of two great guitarists and that’s all I’ll say! Sweet As Honey is a cooking little blues that rocks along from start to finish and should have you out of your chair – wheel or otherwise! Once again the band is aided and abetted by Ron! Last up is the title track, Prisoner Of Desire. A great song and Henry doing a wonderful job on a style of tune which it is not normally his forté – a ballad. Great lyrics and great playing throughout! Having now heard all three Henry Correy & the CORREYDORS efforts to date (and having done that back-to-back) I must truthfully say that this is the best to date. Not by a great margin, but the best nonetheless! Personally, I prefer Mick Pandelis playing to that of Allan Vander Linden from the previous effort and I would remiss if I didn’t point just how tight a rhythm section Henry and Peter Clarke (drums) are on this, their second album together. Henry is singing better than either of the other albums and I think the songs are far stronger. This is an OZ Blues album that you should buy and is an OZ Blues band that you should take the time to go and see playing live! Copies can be had by contacting Henry at henryathenrycorrey.com (manually substiute @ for 'at') for details.